Heck yes. 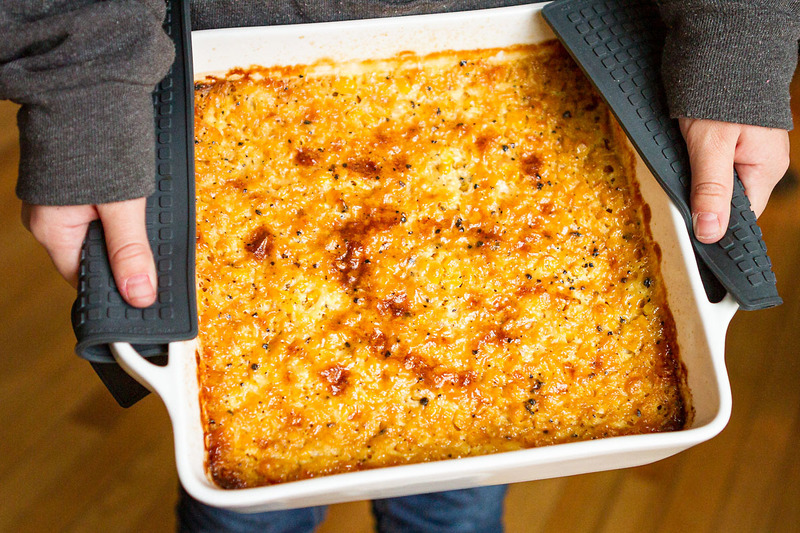 I look forward to corn casserole every year! You give such easy instructions. I love how delicious this recipe turned out. This looks and sounds fabulous. This would be a great side dish for the Holidays. Wish I had a big bowl of that right now. Loving all the caramelized looking creamy corn. Yum! My fiance’s family makes something like this at Thanksgiving and I love it! I’ve never had it anywhere else or made it myself so I can’t wait to try this recipe! This is so great! I love creamed corn! This looks stunning! Perfect to serve up with a holiday meal! I love this time of year for the casseroles alone. This one is super creamy and I’m just waiting for it to come out of the oven. The aroma is driving me mad! I’m impressed with the all the tips and advice you include in this post – looks delish and like a great dish to add to upcoming holiday potlucks. This was so good! Now I’m not sure if non-custardy corn will ever do! This looks like heaven right here. This is one of our all time favorite dishes! I made for a church potluck and had several requests for it again and again. Have it in the oven now for our dinner. Takes me back to my mom making it for fami!y dinners. Thanks for making it available because it’s one recipe I failed to get from mom before she passed away. I have missed it. So happy you found it, Ellen! It’s definitely a great recipe for potlucks — and you never have to worry about taking leftovers home. I have been making this for years, my recipe calls for it to be cooked in a ban-Marie. For more even cooking. I can’t wait to try it with out using it. Would be so much easier. I need to make 400 servings for an event. Do you think it would cook up good in a roaster? I’m sure this question has been asked before but, can you omit the creamed corn and double the corn in the recipe? Hi Vicki! Actually, I think that might be a new one. I’ve never tried making it without the creamed corn, but I suspect that the starchy liquid might be part of what helps the custard set up. If you decide to try it anyhow, I’d love to hear how it turns out! Hi Tara! Turns out I had the creamed corn so I just made it as is. The family enjoyed it so much, that I didn’t even have a chance for a second helping! :o\ Anyway, because of my sweet tooth I may add a little more sugar next time when I make it. And after that, even try it with just the canned corn just to see the difference! I’m curious like that! Can’t wait to try out the recipe again! Thanks for the update, Vicki! So glad to hear you and your family enjoyed it. So delicious! Just like my grandma made, I LOVE the way it browns up on top. Love this recipe. It is just like what my grandma made! Just like grandma’s! Nailed it! This is the recipe I’ve been looking for! I’m growing corn for the first time this year. Is it ok to use an equivalent amount of frozen corn in lieu of the canned whole kernel corn? Hi Kim! I haven’t tried frozen corn, but I can’t see why it wouldn’t work. Soooo good. My whole family loves this recipe and it is requested at all our holiday meals. Thank you so much!! Glad to hear your family loves it, too, Sarah! Can this be made in a cast iron skillet? Hi Jennifer! I’ve always made it in a ceramic or Pyrex baking dish, so I’m not really sure. If you try it, I’d love to hear how it turns out! 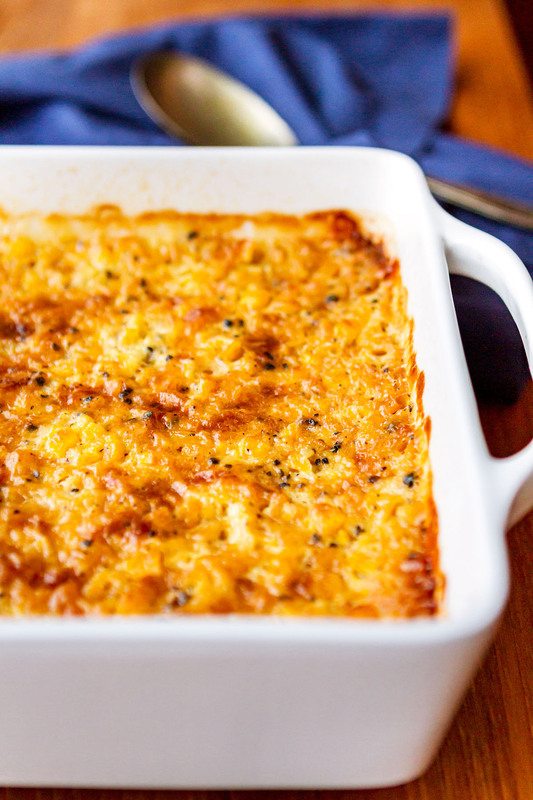 this corn casserole was the best i’ve ever had….it’s perfect! Hi Cindy! I’ve never tried freezing it. I don’t think I’d recommend it because I have a feeling the custard quality would cause it to separate. But if you try it, I’d love to hear your experience. Update: Apparently you can freeze it! It’s definitely best freshly made, but I’ve added instructions for freezing to the post. Love this recipe. It is sooooooooo good. I just made 1/2 of the recipe and it taste amazing. This was super easy to make. Hi can I replace milk with heavy cream? Hi Martel! I haven’t tried this, but I don’t see why it wouldn’t work. It may be a bit creamier, of course. If you try it, please come back and share your results! I’ve never seen a recipe have the flour be whisked into cooled butter – does anyone know the reason for this? Thanks for your question! 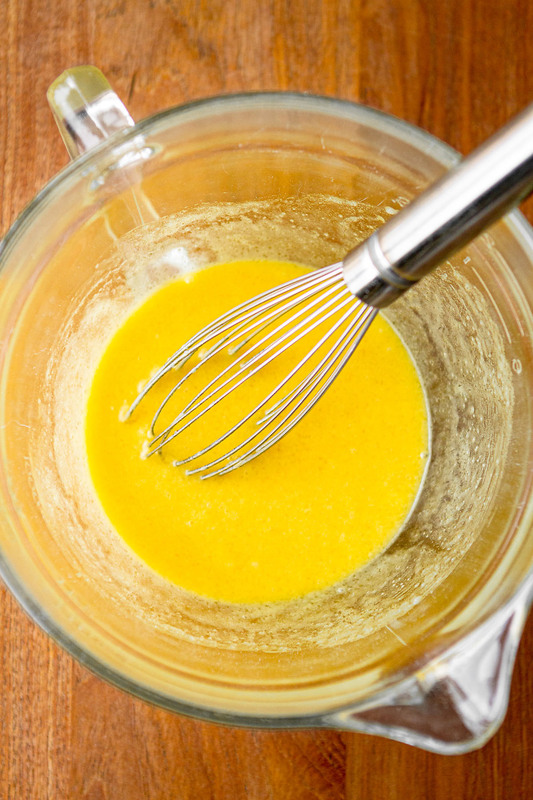 We’re basically creating a custard, so you want to whisk the sugar and flour into the butter. By cooled, we’re talking still liquid but not boiling hot straight off the stovetop or out of the microwave. Is that what you’re finding confusing? I melt the butter slowly on the stovetop, swirling the pan until it’s just melted and then set it aside while I measure out the remaining ingredients. I am Tara’s mom and I have made this recipe for years. We all do it differently. Here is how I do it. I melt my butter in the microwave in the dish I plan to cook it in. (Corningware dish) Even when the butter is hot, I start very slowly to add the flour and whisk vigorously so there are no lumps. It makes a rue and I just keep adding the flour until I have it all incorporated with the flour. Then I add the sugar to the rue and start the milk and then again very slowly I add it to the rue and again whisk vigorously until I can add all of the milk with no lumps. Then I add the eggs and mix, add corns and rest of recipe. I do it this way because it saves washing dishes for me. I don’t like to wash dishes and it is all made in the baking dish I am cooking in. 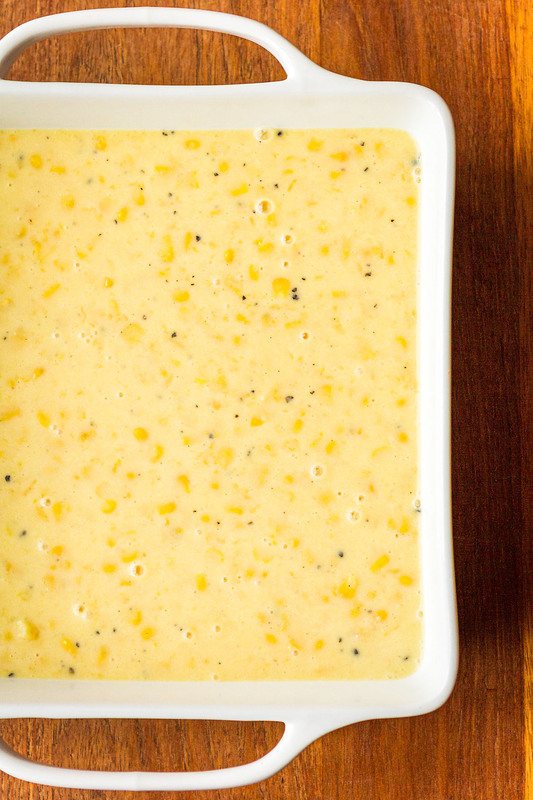 This is the best custard corn recipe around. It will soon be a favorite for you! I think 2% milk should be fine — I know I’ve used it in the past without issues. We’re having family over today for an early Christmas, so I’m making this today, too! I took a chance before you replied lol.. and i had noo problems, made it for our church dinner today and before i could get some it was gone lol . Thanks again ! GOD BLESS.